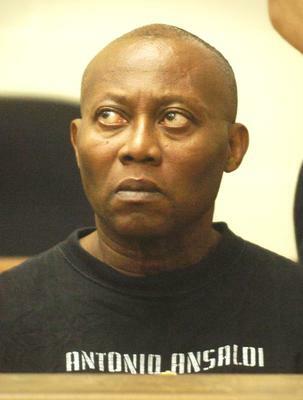 Edward Aduayi, 56, of Abington, Massachusetts, was arraigned yesterday morning for the Wednesday Murder of Karneetha Sanders, of Randolph. Sanders, who was nine weeks pregnant at the time, was found dismembered at Aduayi’s own store in Randolph. Randolph Police and the Norfolk County District Attorney’s Office allege that Aduayi, who had previously been involved with Sanders, picked her up around 1:30 p.m. on Wednesday. Shortly thereafter, the two got into an argument which resulted in him stabbing her several times as the two were in the car – he then drove around the South Shore as she bled to death. Aduayi allegedly told the police that he checked on her sometime after the stabbing and was ‘surprised’ to discover that she was not breathing. Once he realized that she had died, he drove to his Randolph business, where he proceeded to dismember her. Randolph Police found Sanders’ body at 3:30 a.m. at Aduayi’s business after tracing her cell phone to that location. Police discovered Sanders’ dismembered body had been stuffed into a barrel. After his Murder arraignment, Edward Aduayi was held without bail. For emergencies and/or immediate assistance, click here to contact Attorney Lefteris K. Travayiakis directly via e-mail.